Having shocked the sporting world by failing to pay their players in June (and announcing they needed to take out a €150m bank credit facility), FC Barcelona went further today with the announcement of major adjustments to their previously published (although unaudited) results for the year to June 30th 2010. The unaudited results had been published by the previous Treasurer, Xavier Sala i Martin on 30th June 2010 and showed EBITDA of €96m and net profit of €9m on turnover of €446m. The new President (Sandro Rosell) and his executive management have agreed substantial changes to the audited accounts with the club's auditors Deloittes. The changes generally relate to judgments about what revenue and costs to recognise, with the Rosell management and Deloittes taking a far more prudent approach than the previous board. The biggest adjustments come from two connected disputes over TV rights in Spain. FCB are now recognising a potential €37.8m liability to TV company Sogecable and are no longer recognising €18.5m owed by as yet unpaid by current rights holder Mediapro. Mediapro has sought court protection from its creditors due to a dispute with (small world) Sogecable. Although FCB have not yet published a cash flow statement, it seems likely that Mediapro's travails were the main cause of the June cash flow crisis. Whilst the Mediapro/Sogecable adjustments are just tighter accounting practice, the need to make further adjustments relating to land sales and valuations and player sales (including that of Thierry Henry) hint at darker goings on to massage the shape of the balance sheet during the Laporta presidency. The official FCB statement talks of a higher revised debt number of €442m (and €552m "gross debt"), compared to the originally published figure of €326m. From a normal IAS (or UK GAAP) accounting perspective, this is misleadingly high, as Rosell and his team like to include all sorts of short term liabilities in their numbers (such as prepayments). We will have to wait for the full accounts to see the true debt position. Yesterday, on the same day they announced the signing of Joe Cole (a “good day to bury bad news”? ), Liverpool FC slipped out a juicy little press release about ticket prices for members (of which I understand there are around 15,000 available per game). The gist of the statement is that prices for 2010/11 are rising by a blended 10.6% for the Kop and 10.1% for the other three stands and that’s prior to the impact of the “progressive” VAT rise in January. Although the price rises vary by category, the message is clear, Liverpool are joining United in the debt driven game of pricing out their core working class support. The Kop now has the dubious privilege of being more expensive than the Stretford End which, when you consider the relative quality of football, is a true injustice. LFC are in real financial trouble, something it actually gives me no pleasure in writing. 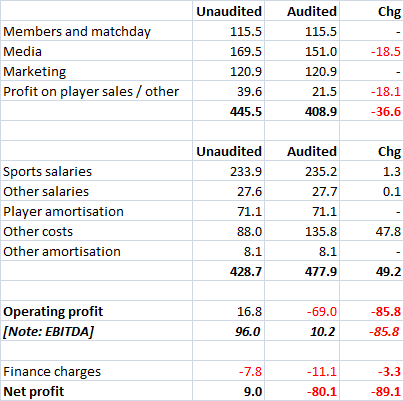 In the last accounts (2008/09), the club reported EBITDA of £35m and interest of £40m. The dream of a new stadium was screwed the moment the credit crunch hit, leaving the business enormously overleveraged. Despite a valuable new shirt deal with Standard Chartered, the loss of Champions League income will inevitably impact the top line this season. That leaves Chelsea supporting Chairman Martin Broughton scrabbling around for other ways to boost revenues. 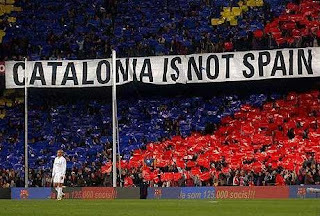 So now we have the spectacle of both of England’s most famous and successful clubs screwing their core support to pay the debts of unwanted speculators. All the while the Premier League and Football Association stand around being “ownership neutral”. Is this truly the “Best League in the World”? A quick trawl through books about Manchester United on Amazon shows that two genres dominate, history and biography. Whilst that comes as no surprise, it’s a shame that there isn’t more decent writing from the people who actually are Manchester United, the fans. Dan Harris’ new book “On the Road: A journey through a season” is a welcome step in filling that gap. On the Road brings together ex-lawyer Harris’ successful blogs for ESPN Soccernet following United away from home during the 2009/10 season. Harris blends match reports with observations on modern football and the existential angst of being a football supporter. Written over the course of a whole season rather than after its conclusion, it perfectly captures the mental gymnastics all football supporters go through; from hope, through fear, a bit of anger, more hope and eventually (in a sport where most teams win nothing) the resignation of failure. If that all sounds a little serious it really isn’t. Harris is a very funny writer (could he really have been a lawyer?) with a fantastic ability to be very rude about deserving people and places in new and amusing ways (although to be fair Garry Cook is the gift that keeps on giving). Being 2009/10, green and gold, bonds, PIKs and the Glazers make their share of appearances of course. Harris stopped going to OT in 2005 on principle and now relies on favours, mates and swaps to get his precious United fix at aways. It won’t come as a surprise to hear I share his views on the subject of our owners, but I do recommend his calmly angry take on the financial alchemy that threatens the long-term future of our football club. Re-reading On the Road as one work rather than individual blog posts through the season, the book works really well. Football seasons are long journeys with numerous diversions on them and Harris does a great job of taking the reader down these little paths (Fergie’s “unfit” referees comments, Bellamy bravely hitting a supporter who was being held by stewards, the great Oakwell half-time pie robbery....) before returning to the main subject. All this is done with the authentic voice of the proper, critical, clued up supporter Harris clearly is. Recommended. 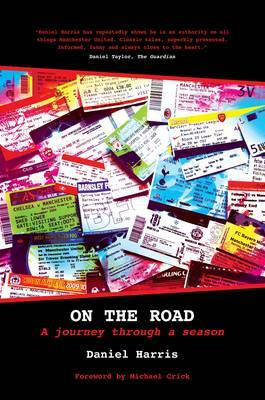 “On the Road: A journey through a season” will be in good bookshops in Manchester and London later this week and can also be bought direct from Waterstones using this link. ""Sport absolutely overpowers film and everything else in the entertainment genre… we plan to use sports as a 'battering ram' and a lead offering in all our pay television operations." The recent decision by OFCOM to regulate the wholesale prices BSkyB can charge for Sky Sports 1 and 2 has raised question marks about the use of the "battering ram" in the future and hence the ongoing value of UK sports right. Today we saw the first effects of the ruling (which both BT and BSkyB are appealing against) for consumers. BT have announced a new BT Vision offering that significantly undercuts Sky's pricing with SS1, SS2 and ESPN on offer (with a broadband package) for £29.98 per months vs. Sky's £52.50 and Virgin Media's £59.00 (see BT's comparison here). "Our overall take is that it looks more aggressive than it needs to be. We had expected aggressive pricing with BT potentially even willing to price at a loss on Sky Sports but the pricing is generally lower than we have anticipated. Strategically the right move by BT but perhaps at the wrong price." You might imagine that BSkyB's response to this would be to cut consumer prices in response, but in fact they are taking the opposite approach, and will tomorrow announce that retail prices are actually going up. OFCOM's ruling on wholesale rates uses a formula that deducts a fixed margin from Sky's retail prices to determine what they can charge wholesale customers. By raising retail prices, BSkyB can thus raise wholesale prices too and squeeze the likes of BT and Virgin Media. Sky claim their price rise reflects the additional Premier League matches they will show for the next three seasons (having won five of the six packages available vs. four out of six for the last three year deal). No doubt there is some truth in this, but the move looks more like an attempt to make BT's strategy untenable almost before it has begun. For now, Premier League clubs can look on as this scrap progresses without being impacted themselves. The interesting point will come in around eighteen months when the bidding for the next three year deal begins. The outcome of BT and BSkyB's appeals against the original OFCOM decision, the new government's stance (the Tories had been quite anti-OFCOM before the election) and the extent of any market share moves as BT and Sky's retail prices diverge so radically will all have a major impact on how much BSkyB will be prepared to pay for Premier League football next time around. "The effect [of the OFCOM ruling] will be to subsidise companies that have shown little appetite for investing in our content and fundamentally damage the investment models that have helped sport become a successful part of the UK economy and made sport so attractive to UK consumers."